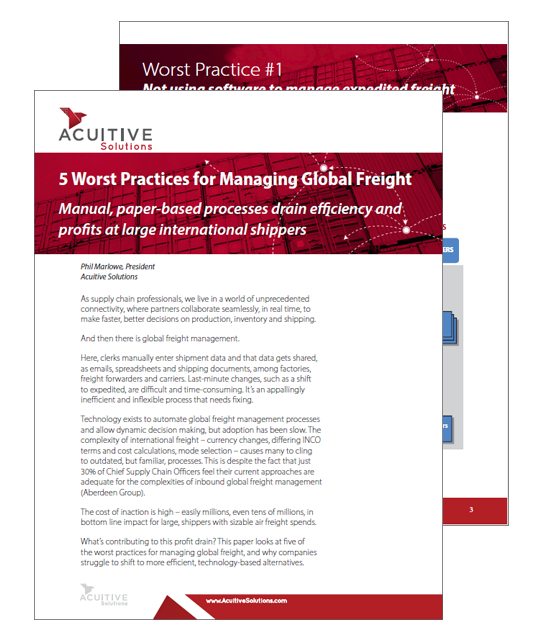 Acuitive’s cloud-based global TMS makes it easier for Fortune 1000 companies to manage global inbound freight moves. Our rules-based portal lets carriers and suppliers collaborate to manage air and ocean shipments and audits with almost no direct shipper involvement. Acuitive software was built specifically to manage the complexity of inbound air and ocean shipments. Built by international logistics experts, not software programmers. We are roll-up-your-sleeve problem solvers who apply automation to take time, cost and complexity out of global freight management. Our supply chain software is in the cloud, but our heads are not. Acuitive is in use and delivering millions of dollars in value at some of the biggest brands in the fashion and retail industry. Our cloud-based software is built for modern problem solving, where supply chain partners collaborate virtually and in real time. No more emails and spreadsheets. Acuitive’s subscription model avoids the risk and high cost of purchased supply chain software. Training takes hours, not weeks or months.